Have you ever bought an ingredient because it was fresh and very well priced or for a specific recipe but had leftovers that you could not figure out how to use up? Many of the recipes we develop in our Chef and Steward kitchen actually came from this dilemma. How do we re-use the main ingredient in a way that brilliantly showcases it and prevents the usual dismay with eating “that again?” We really do believe that if done well, we can manage to enjoy the same star food in different ways or with other flavour combinations that are not typical but soothingly delicious. If we have not yet succeeded in making a beet lover out of you, we hope to do so over the next few posts. This is a simple one. It starts with the tutorial on how to roast and prep the beets in our Apple and Roasted Beet Salad post. The trick is the prep so you must read that post for the details! 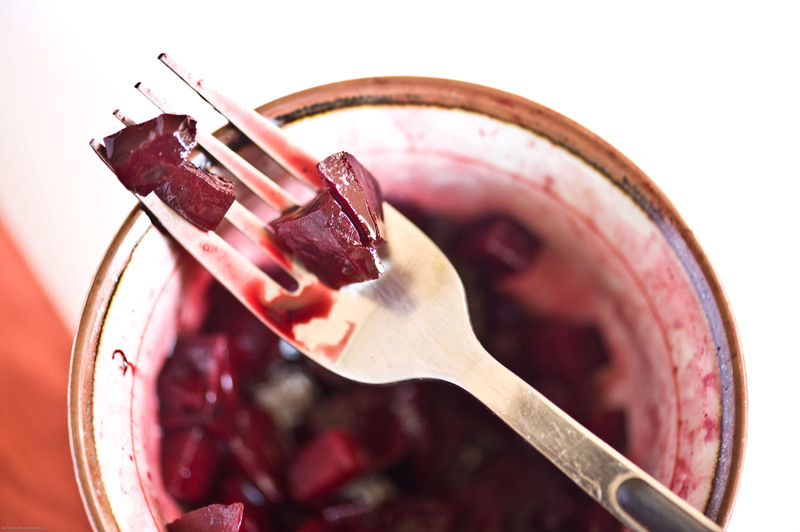 Spread beets in an even layer in a container with a wider bottom. This allows for more of the liquid to coat each piece of beet. Pour the balsamic vinegar over the beets and cover with cling wrap, foil or a lid for the container. Let it rest for at least 2 hours in the fridge, tossing occasionally. It is best if left over night, which means it is can also be made a day ahead of your dinner party. Right before serving, you can bring to room temperature or serve slightly colder, however do not serve straight from the fridge. Taste and add salt and a crack of pepper if desired. When allowed to marinate, the earthy, spicy notes of the allspice will rise to the fore for an unexpected flavour. We promise you will never buy those pickled beets in the can ever again! Oh, I adore pickled beets…and even enjoy those in a can. But I know these are SO much better…thanks for sharing your beautiful photo and this delicious recipe! This one I’m sending to my mother. She loves pickled beets! Fantastic salad, and so healthy! Kristi, we hope your mother likes it as much as we do! We can eat loads in one go! I love roasted beets so I will definitely try them pickled. Love the addition of allspice. I know exactly why:) but yes, with this recipe, it is worth revisting! Not only are beets one of my favourite vegetables, but when roasted they are the favourite vegetables! and then pickled?! that is pure goodness to me! PS are your pictures for real?! Stunning!! Dima, you hit the nail on the head (like twice). 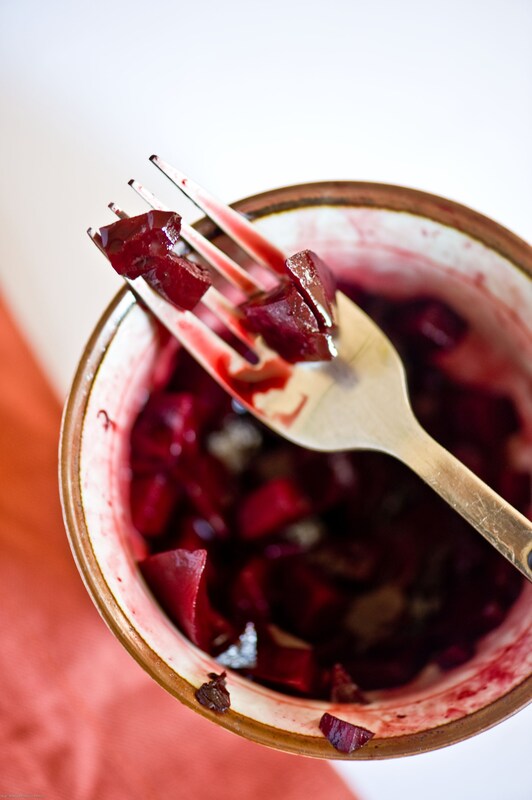 Beets are indeed best roasted and balsamic vinegar is unto beets what salt is to pepper- a match made in heaven! Thanks about the pics… we wanted to show the oozy juiciness of the beets with balsamic. Ha! I bought beets the other day for this exact reason. I had no plans of what to make, but they were just such a great price that I couldn’t resist. Great use for them, they look really good! Alyssa LOL! Sounds like we had you in mind huh? So now you have two recipes for those beets… the previous post has a lovely Apple and Roasted Beet Salad that you can get both recipes from the same roasted lot. What a wonderful idea! I love beetroot but my daughter is absolutely obsessed about them and so I’m looking for different ways to use them since the French are so classic. I’ve done a spicy macaron out of them, but it’s high time I made this pickle. She would adore this! Sounds fabulous and the pic is incredible. Thanks Jill! We know your daughter will just be delighted if you made it! Congratulations on Top 9 dear friends!!! Woo hoo! Thanks for your buzz! Wow, I just saw these on Foodbuzz Top 9, Congrats to you, My first time here. I am definitely going to make these, love pickled beets. I eat them right from the jar. These looks and sounds so tasty. Glad I found you! Have a great week. Suzi, we are thrilled you have come over to visit and we will come over to your blog too. You have to make these, but don’t blame us if you cant stop eating them! I love beets! I much prefer them fresh as opposed to the spiced beets in the jars, but it’s probably because I haven’t eaten the right ones! One of my favorite ways to eat them is in a salad with goat cheese. I can’t wait to make these and try them. Thanks for sharing this recipe.